How I choose the right size? All climbing shoe models fit differently. Let our Shoeculator help you find the right size compared to your old climbing shoes. Easy! Note: Leather climbing shoes can stretch and become up to a whole size bigger, while synthetic shoes tend not to stretch at all - something to think about when sizing up your new rock shoes! A little stiffer through the midsole, the Tarifa is Alex Megos' preferred choice on any climb that features lots of technical micro-edging. Who are we to argue with Megos? 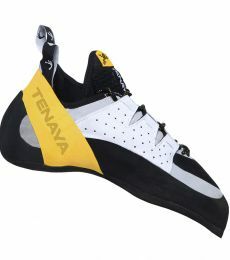 The midsole has been made to be stiffer, the laces allow for a more precise fit and create a stiffer edging platform, and Tenaya's signature RB RangeX and SXRDynamics technologies that work with the foot's biomechanics increase the shoe's responsiveness, allowing you to climb more intuitively and be more stable and controlled on foot holds. Moderate camber, a slightly downturned toe, and thin 3.5 mm Vibram XS Grip rubber provide performance and sensitivity on overhanging terrain for varied sport climbs and boulder problems. The fast-lace system is quicker and easier to use than regular lacing systems for faster on-and-offs in between climbs. The synthetic upper means you can wear this shoe straight out-of-the-box with no breaking in required, and you can be sure this no-stretch material will maintain the shoe's powerful shape. The Tarifa is a great shoe for narrower feet. For any climber seeking a high-performance sport climbing and bouldering shoe who often climbs vertical faces or limestone edges, the Tarifa is supportive and stiff, yet sensitive and aggressive. Perfect for all types of climbs. Original rubber compound built for pure friction, recommended for use where maximum grip is the primary need - bouldering and sport climbing, indoor climbing, or extremely smooth, polished routes. 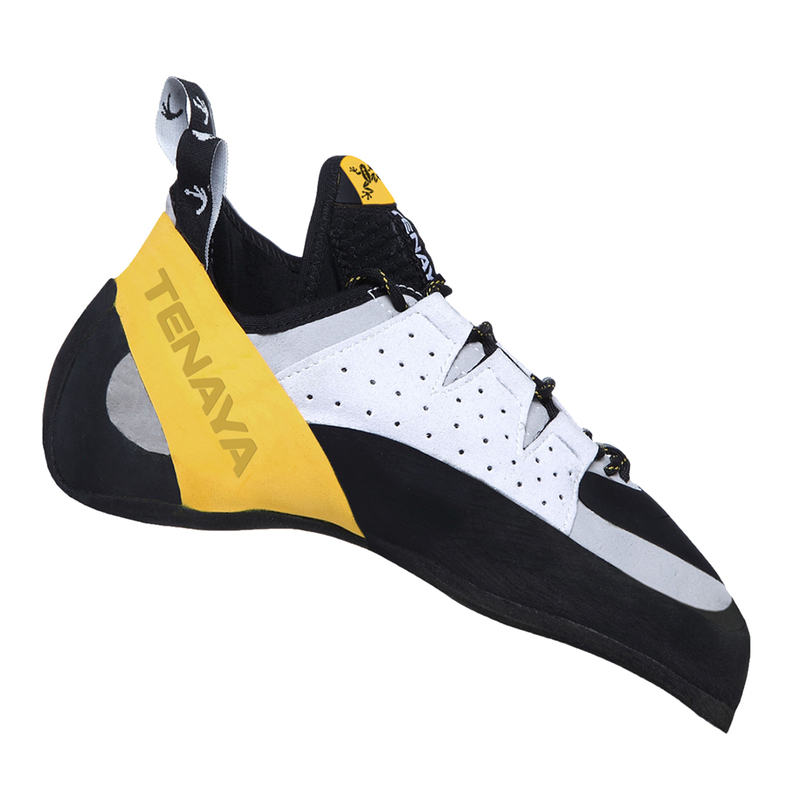 Tenaya's movement-adjustment system that focuses power towards the big toe. This system is unlike any other found on a climbing shoe. It actively adjusts power based on the foot's position for smart precision on the smallest of features which prevents the rand from bulging out, which can knock you off balance. This means you have more control, more balance, and more power, on every foothold. Incredibly tight yet comfortable fit, great edging and precision in the front of the shoe and the stiffness gives them a lot of power. There's just a few minor things that could do with improvement... The rubber strip on the heel is very narrow meaning that much higher levels of precision are needed when doing any technical heel hooking, the rubber on the top of the toes designed to assist in toe hooking began to peel off after only a few months use (stuck back down with shoe glue). And sadly I wore through the front of the rubber quicker than I have with any other pair of shoes, happened to the left and right shoe in the same week! Overall a great shoe (one of my faves), I just wish they had a bit more rubber on the heel and a longer last to them. I wear street shoe 43 and get these one on 42.SUPER comfort and great smearing ability!Very good edging too in all types of rock...the vibram xs grip is like glue to the rock.The heel its superb for heel hooking!!!! !super sticky!!! !The next pair i will try the 41.5 because i want more snug fit and tarifas strech a full size...maybe 2 sizes down its not o problem too!The fit its like a glove no dead space at all!TANAYA its the brand ONLY for me!! !However i recommend theses!!!!!!!!!!! I find Tarifa's an excellent shoe, in the line of Tenaya: Comfort and performance. I also have a pair of Iati's and I find the sizing really similar (have 44 on both, street size is 45). The lacing system in the Tarifa's is perfect to maintain the fit even when the shoe starts to be worn off and gets softer. In the Iati's, I felt the heel a bit wide, but with Tarifa's I feel like it fits better. Toe box is similar in both models. In summary, I find Tarifa's to be a very good option for any kind of climbing if you are looking for a lace model.